Even if that were true, it would be the only time Ralph Young has been “just plain” anything. His engineering career is a success story on an international scale. His name is known and respected in Thailand, Oman, Saudi Arabia and many other nations, as well as in his hometown of Stanford, Kentucky, for his engineering skills, his integrity, and his service to others. As it did for many in his generation, service in World War II came before college studies. Mr. Young served for three years in the Pacific as a gunners mate on the USS J. Franklin Bell. 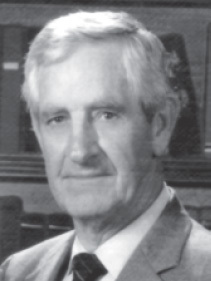 Following graduation from the University of Kentucky in 1953 with a Bachelor of Science degree in electrical engineering, Mr. Young began his career at the Toledo Edison Company. He moved on in 1956 to Sverdrup & Parcel Consulting Engineers in St. Louis, where he enjoyed a creative and productive 16-year association. It was during that time that he first achieved international success. In 1960, he was named project engineer for the Yanhee Project, a major power project in Thailand that consisted of a 570mw hydro-electric dam and several hundred miles of lines and substations. Mr. Young oversaw the location, design and construction management of the lines and stations. Through the 1960s, Mr. Young had a key role in his company’s involvement in the development of extra high voltage lines, which became a necessity for better service and efficiency. He developed a design manual used in seminars for S & P personnel. By 1970, the company had established an electric utility department, and Mr. Young was placed in charge. Staff grew from one to 68, and annual billing grew from zero to five million dollars. Mr. Young’s talents were in demand. The Charles T. Main Company recruited him to be project manager for a major project in Central Java, Indonesia. Again, his work drew notice, and the L.E. Myers Construction Company asked Mr. Young to expand its engineering division. Under his leadership, between 1973 and 1985, the division grew from 15 employees to more than 200 engineers, technicians and support staff, and annual billings went from $340,000 to more than $10 million. Mr. Young created a wholly owned subsidiary for L.E. Myers called LEMCO Engineers. He developed major power projects in Saudi Arabia, Oman, Indonesia, Thailand and Malaysia. A project in Iran was interrupted due to political instability and was never completed. His 1985 retirement didn’t last long. He and five other former LEMCO engineers formed a new consulting firm – D. Ralph Young and Associates. Over the next five years, the new company acquired several firms, including LEMCO. Again, with Mr. Young’s leadership, there was phenomenal growth. Annual billings increased to more than $15 million, and the staff grew to more than 300. He began a project that provided logistical help to Thai, Indonesian and Iranian students who wanted to further their education in the United States. More than 100 students received that assistance. Mr. Young worked “more than full time” during the first two years of his company’s existence. He gradually reduced his workload until he retired a second time in 1991. Kentz Corporation, an Irish company, called on Mr. Young in 1994 to assist with business development in Asia. He played a key role as the company, as part of a joint venture, was awarded a $50 million project by the Thai Oil Company. Mr. Young’s many honors include recognition by Thai and Indonesian officials for his work on projects in their countries. His commitment to his work hasn’t kept him from serving in other ways, including Habitat for Humanity. He has been active in his church, not only as a teacher and leader, but also as an engineer, using his talents for building design, inspection of electrical work, and construction of new facilities. Mr. Young resides in Stanford, Kentucky. Charlotte Chadwell Young, his wife of 59 years, died in October 2006. They are the parents of three children: sons Dane (deceased) and David Young, and daughter Marsha Meier.